The approach into Edgartown Harbor. Edgartown has one of the most picturesque harbors in New England. County, town, and port of entry, Edgartown lies 91 miles S.E. from Boston, 20 N.W. from Nantucket, 28 S.E. from New Bedford, and 20 S. from Falmouth. First settled in 1641, Edgartown was incorporated, 1671. If the lighthouse to starboard and the beach club to port as you enter the harbor look familiar, it's because they were sets for the movie, Jaws. The 19th century mansions that line the bluff to port hail back to the times when ships captains wealthy from the harvest of whale oil built their homes 200 years ago. 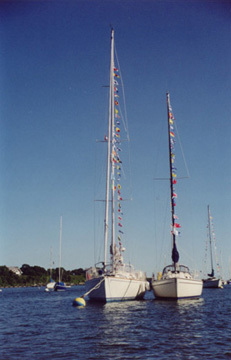 Edgartown Yacht Club has been upholding the yachting tradition since the turn of the century. They do not have moorings or slips but they do extend privileges to visiting yachtsmen from reciprocal clubs. A dinghy dock and restaurant are available for use. Please adhere to their dress codes and rules while visiting. Edgartown was the Island's first colonial settlement and the county seat since 1642. The stately white Greek Revival houses built by the whaling captains have been carefully maintained, preserving the flavor of a seaport village from the early 19th century. Main Street is a picture book harborfront setting. The tall ships are mostly gone from the Edgartown scene, but the heritage has continued. 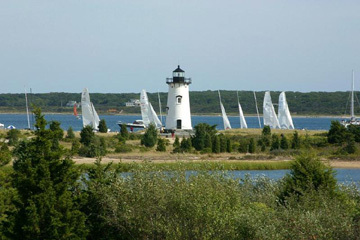 For the past hundred years, Edgartown has been one of the world's great yachting centers. From the porch of the Harbor View Hotel, there is plenty of activity to peruse in the picturesque harbor. North Water Street has a row of captains' houses not equaled anywhere. Study the fanlights and widow's walks by day and stroll down the streets after the lamps are lit. South Water Street is dominated by a huge pagoda tree brought from China as a seedling by Captain Thomas Milton in the early days of the last century. The house beyond it was that of Captain Valentine Pease, on whose ship Herman Melville made his only whaling voyage. Many houses in Edgartown predate the whaling era. Most are private residences, but two notable ones are museums open to the public: The Vincent House (built in 1672, the oldest known house on the Island) and the Thomas Cooke House. At 34 South Summer Street, you'll find the office of the Vineyard Gazette in the home built by Benjamin Smith in 1760. Across from the Gazette is the Federated Church, built in 1828. It still has the old box pews, which are entered through little doors and have narrow seats around three sides. The famous Old Whaling Church with its six massive columns commands Main Street. Built in 1843 at the height of the whaling industry, the Church was given to the Martha's Vineyard Preservation Trust in 1980. It has been transformed into a performing arts center. Next door is the Dr. Daniel Fisher House, built three years before the Old Whaling Church. Shopping, strolling, and sunbathing are top activities for the Edgartown scene. There are excellent public beaches within the township: Norton's Point, known as South Beach or Katama, is a barrier beach providing surf bathing and the opportunity to explore Katama Bay on the other side of the dunes. A bus heads to South Beach from in front of the post office on Church Street every 15 minutes in season. Wasque and Cape Poge on Chappaquiddick are both unspoiled areas favored by fishermen. Lighthouse Beach, located off North Water Street near the town center, offers calm water and views of harbor activities. Bend-in-the-Road Beach, part of Joseph Sylvia Beach, has ample parking and is accessible by bicycle. Felix Neck is about three miles outside the center of town on Vineyard Haven Road. The 200 acres, owned by the Massachusetts Audubon Society, provide marked trails and a program of wildlife management and conservation education throughout the year. 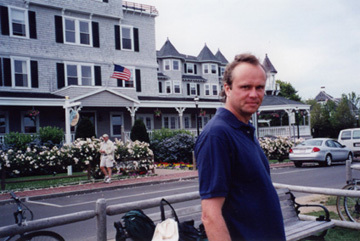 For a walking tour of Edgartown, please click here to view the Vineyard Gazette. The oldest house on the Vineyard is Vincent House, now a mudeum at 99 Main. This shingled colonial cape dates to 1672 and belonged to the descendents of the same family until 1977, when they donated it to the Preservation Trust. The Federal style house in the backyard of Vincent House is The Daniel Fisher House. The Old Whaling Church is a strong example of Greek revival style popular with the whalers, and the Dukes County Jail is a pleasant inn-like white colonial building at 149 Main. If you get tired of walking, hop the trolley at North Water Street; it stops at Midway Market, A&P, and Mainer's Lane shopping complex. 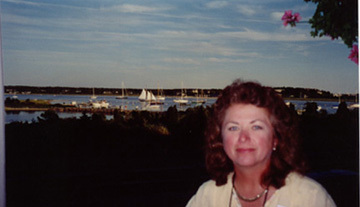 Edgartown (Old Town) harbor is on the east side of the town, at lat 41°25'N., lon. 70°25'W. The township includes the island of Chappequiddick, which is 5 miles in length and 2 1/2 in breadth, which forms Old Town harbor. Chappequiddick, acccesible by ferry from Edgartown, is said to be the only place in the state where grouse [the Heath Hen] are native. The Edgartown Harbormaster is located at Memorial Wharf, and can be hailed on VHF Channels 9 or 74, with 74 as the working channel as well. Reservations can only be made online beginning March 1 NOT by phone. The harbor is well protected, with lots of moorings. Dockage is extremely limited and should be reserved as early as possible. Watch out for the ferry which crosses between Edgartown and Chappaquiddick every fine minutes. Anchorage is available across from Edgartown Light House just in front of the Chappy Beach Club. The anchorage is located in the outer harbor to the port side of red nun bouy #8 and is exposed to the North. Katama Bay is now off limits as an anchorage so it pays to plan ahead to reserve a mooring during the peak summer months. The Harbormaster may open Katama Bay under some northerly conditions. If Katama Bay is opened then yachts may anchor south of green can #13. Harbormaster can be contacted on VHF channel 74. When the wind changes direction yachts are asked to leave Katama Bay and re-anchor in the outer harbor. 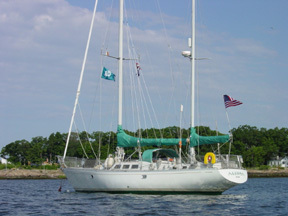 Old Port Launch provides service to the outer anchorage from 0800 to 2400; hail them on VHF channel 68. The Harbor is a no discharge zone and free pumpout services are provided. Contact the Edgartown Pumpout Boat on channel 74. Fuel is located on North Wharf. Fuel Dock hours are 8am - 5pm. Water is available while fueling at North Wharf or at the Water Barge located in front of North Wharf. Ice is available at Captain Porky's Bait & Tackle, Town Provisions, and The Quarterdeck. Vineyard Propane is at Dukes County Airport near Edgartown (508) 693-5080. There are three chandleries: Herring Creek Marine (508) 627-7752, Martha's Vineyard Shipyard (508) 627-6000, and Great Harbor Boatyard (508) 939-8686. Showers and restrooms are available to visiting yachtsmen in town at the Edgartown Visitors' Center on Church Street and at North Wharf on Morse Street. Provisioning is best at Town Provisions on Mayhew Lane (508) 627-7557 or the Stop&Shop on Upper Main St. 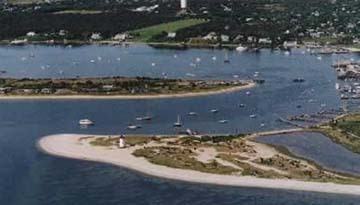 The Edgartown mooring field. Yachts are permitted to raft together when necessary. The Hotel with its "magnifi-scent" rose garden. Tours, kayak rentals, bird watching. 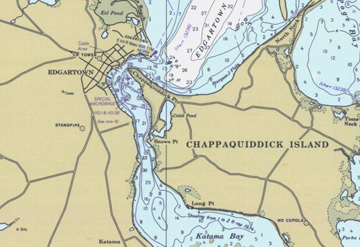 Click here to view a street map of Edgartown (large file).